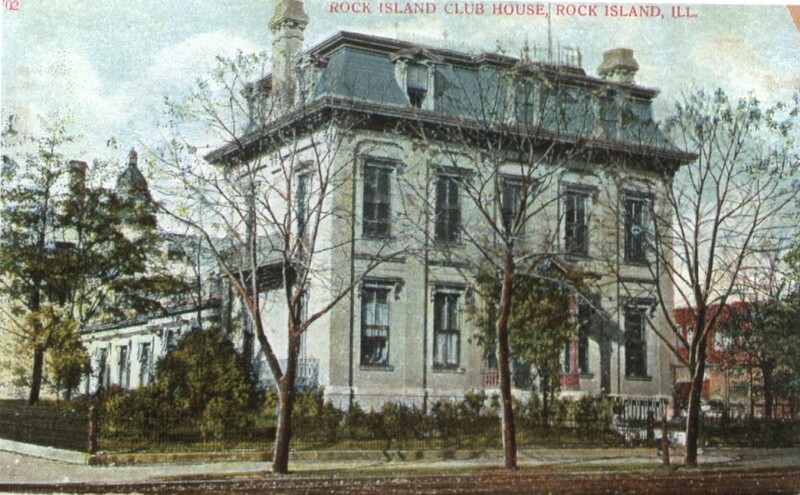 This postcard is identified as the home of the Rock Island Club, but it’s easy to tell that it was a home at one time. Like many of Rock Island’s earliest residences, it was built near the center of town. In the mid 1800s, our commercial area was located on First and Second Avenues, between 15th and 19th Streets. The nearby streets and avenues were mostly residential. Over the years, virtually all of these close-in homes have been removed to make way for the expansion of downtown. As early as 1855, a large home stood here at northwest corner of what was then called Buffalo and Orleans Streets. It was occupied by William L. Lee, a partner in the Lee and Wilman crockery and glassware store, who later became Cashier at the Rock Island Bank. When Mr. Lee died in the 1860s, his wife, Elmira, and son, Milo, remained for a few years before selling the home to Judge Cornelius Lynde, Jr. In 1876, during Judge Lynde’s ownership, the address was changed to 226 16th Street as Rock Island eliminated street names in favor of street numbering. In the Holland’s City Directory of 1876, architect Isaac Holmes stated that he and his assistant Ben Gartside had remodeled the home for Judge Lynde. That remodel changed the appearance of the old Lee home to create the house shown on our postcard. The original home was probably in the Italianate style, while the Mansard roof here defines this house as a Second Empire style. The Second Empire style had a very brief popularity in Rock Island during the 1870s. (Although it should be noted that there was a revival of the Mansard roof in the 1970s for fast food restaurants.) The style is called Second Empire because it originated much earlier during that era in France. The roofline provides additional headroom in what normally would be an attic, thus creating more usable floor space. In addition, the steep roof pierced by ornately framed dormers and chimneys adds an undeniable elegance. The style is now quite rare here, with only a handful of examples remaining in the Rock Island. Cornelius Lynde, who was born in Vermont, came to Rock Island in 1844. He was elected a probate judge at the age of 31 in 1857. In 1858, he became a bookkeeper for Philander Cable of Mitchell and Cable bankers and shortly thereafter purchased Mr. Cable’s interest in the bank. As well as being a partner in the Mitchell and Lynde banking firm, Judge Lynde was a director of several railroad companies, the Coal Valley Mining Company, and Rock Island Glass Works. After his sudden death of apoplexy in 1888, the house was sold to a physician, Dr. C. B. Kinyon, who maintained his practice here during the 1890s. Dr. Kinyon was followed briefly by another physician, Dr. Henry Chase, although Mrs. Kinyon still owned the home. In the meantime, in 1896, a group of prominent Rock Islanders set out to form a new organization, which they called the Rock Island Club. Frank W. Bahnsen was its first president, and initial membership was a healthy one hundred, with virtually every well-known Rock Island family name represented. Newspapers of the time specify that “of course” the main purpose of the organization was social. Nonetheless, a civic responsibility was reflected in fourteen standing committees which promoted, among other things, local improvements, the Rock Island Arsenal, and local manufacturers and railroads. The club claimed responsibility for the building of the Illinois Theatre (another postcard story) as well as establishment of a small arms plant at the arsenal. In 1901, the Rock Island Club purchased this home from Mrs. Kinyon for $12,000. They immediately set aside another $5000 for remodeling which included building an addition at the rear for a bowling alley and billiard room with a gymnasium above. The third floor of the house was converted to a large hall. Completion of these improvements was celebrated with a smoker attended by four hundred. Such social events were ongoing “of course” and frequently consisted of smokers or “minstrel shows.” The Argus of April 26, 1902 shows interior photos of the house, including an elegantly furnished formal parlor with massive carved woodwork and tall windows. By 1911, the Rock Island Club was successful enough to build a new and larger home at 222 19th Street. When the club moved from our postcard house, the Royal Neighbors of America moved in, although title to the house was not transferred to RNA until 1920. The club remained at the 19th Street building until the late 1920s, when the organization disappears from city directories and the 19th Street building is taken over by the Elks Club. RNA used this home until 1927, then razed it to permit construction of a new RNA headquarters building. A Real Photo postcard, identifying the building as the “Supreme Office of the Royal Neighbors of America” shows the house from a different angle, with the Rock Island Club addition at the left. The loss of this elegant and unique house with its marvelous interiors is sad. Yet it is consoling to know that its replacement, although very different in architecture and scale, is also unusually beautiful and historically significant. This article by Diane Oestreich is slightly modified from the original, which appeared in the Rock Island Argus and Moline Dispatch on May 12, 2002.